Panama hydro electric, Paso Ancho. Panama is running out of power. The reasons are simple when you find that just one of Panama City’s large shopping malls uses more electricity than an entire province such as Herrera. With the seemingly never ending construction of tower blocks in the capital, our need for new, renewable sources of power is only going to increase. The town of Volcan, on the west side of the Baru Volcano is slated to become Panama’s hottest retirement destination with at least 5 sizable projects planned, or in the opening stages of development. So where is the electrical power for this expansion going to come from? The answer: the Paso Ancho HydroElectric project. Panama is blessed in two ways when it comes to natural resources. First we have copious amounts of rain and second we have a long mountain ridge that stretches the entire length of the country. Combining the two means we should be able to generate all of our power needs now, and in the foreseeable future from the most efficient, renewable, and most environmentally friendly production method – hydroelectricity. The Paso Ancho hydro facility is modest as hydro projects go, it plans to produce somewhere between 6 and 12 megawatts of power. How much power is that? 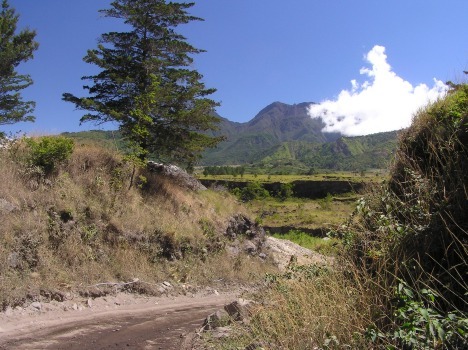 Volcan, a town of around 10,000 or so inhabitants currently uses less than 1 megawatt. 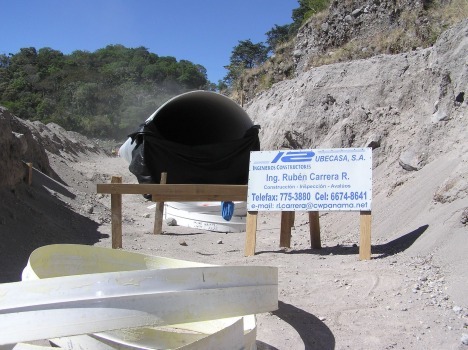 Power at the moment comes from the Macho Del Monte Hydro project at Cuesta De Piedra. This small hydro generator originally produced just 1 megawatt and this was enough for both Volcan and the nearby town of Bugaba. Its production has been upgraded to 3 megawatts, to handle the increase in local demand, but with the growth of this part of Chiriqui, soon this will not have the capacity for local needs. The Paso Ancho Hydro facility is located on the northern side of the Chiriqui Viejo river, close to the small hamlet that bears its name. I was invited along with my friend Ivan Flores to see the project by Isidro Quintero, the number 2 engineer and longtime Volcan resident. Isidro outlined how the energy will be generated. First, ANAM ( Panamanian environmental authority) has allowed 6 cubic meters per second to be diverted from the river. 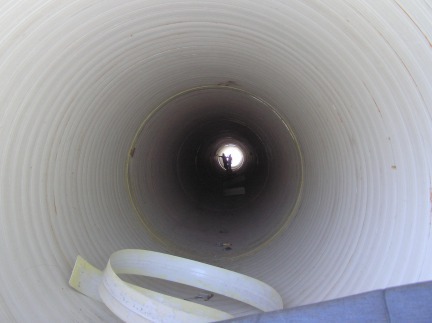 This will sent down 250 meters of 2 .5 meter wide plastic pipe. The water will then be stored in a large man-made holding lake. Then the water will be run down a 70 degree incline to the generating station where it will power a large turbine. Then the water will be returned back into the Chiriqui Viejo river. The power from the facility will be sent via transmission lines to Volcan and a Union Fenosa substation will handle the distribution. Excess power will be sent into the new Latin America grid. The new grid is a two-way street – so if we have difficulties here in Panama we can of course draw our power from someone else who has power to spare. I did attend a meeting in Volcan of a small group of people who voiced concerns about the proposal for possibly three hydro facilities in the area. Although they did not specifically oppose the Paso Ancho project, they did have serious questions about the next planned facility near Caizan. One woman said the offer from the company to buy her land was not enough, although I was unable to find out from her how much they did offer and how much she thought her property was worth. At the Paso Ancho project I did talk to the head engineer, Eduardo Astúa Chacón about the environmental impact. He told me that they started doing the studies back in 1999, and now this project meets all government requirements. He assured me on several points, first, the river would not be dammed. They will only divert some of the flow and this of course will be returned to the river a few kilometers further down. 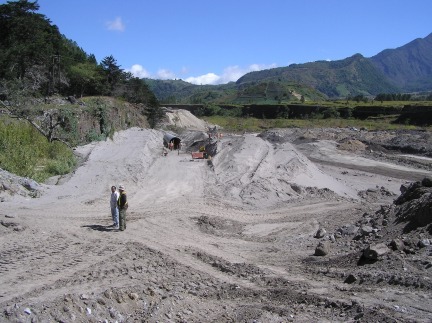 There will be a separator at the diversion point to ensure that fish are not drawn into the tubes and that when all the excavation is completed the area will be landscaped. A final note: the project will save Panama some 5,000 barrels of oil per year. A surprising window on the past. 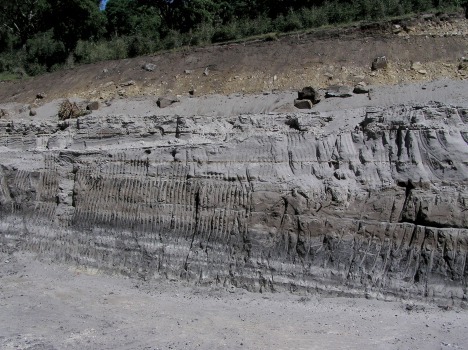 One wonderful revelation that came about during the excavation of the holding lake was the exposing of the geologic layers of rock and pumice. Isidro Quintero showed us the 8 inch ash layer that most probably originated from the 1450 Baru explosion. Further down he showed us something that had both Ivan Flores gasping. “see that ash layer,” he said as he pointed to a 9 foot high gray layer of sediment. My reaction was to say, “holy cow.” If this indeed is an ash deposit from a volcanic blast then Panama has had a “big bang” of its own to rival or surpass that of Krakatoa or Tambura. Keep reading yourpanama.com because with some help from the geological community we may have a story from Panama’s past that will be world news. The project will cost $6 million dollars when finished and employ upwards of 60 people. A final question that needs to be answered is why are we producing more than we need locally? Basic economics will tell you that we do not have the local user base here to justify the cost of construction of projects such as these. The developers need to sell the excess to get their return on the capital they have to lay out. So, if some of our electricity is used to light homes, hospitals and schools in Costa Rica, should we really care. In today’s world electricity is as important to human development as water and food. So in the true Panamanian spirit of friendship and generosity we should be happy to extend a helping hand to our resource challenged neighbors.